Photos taken at the ‘Man Of The Golden Star’ New-Topical, Cyberrock, Dance-Electronica, Orgastica-DJ & Cyberpoetry Concert by Michel Montecrossa and Mirakali in the Omnidiet Music-Hall in Mirapuri on 13th April 2019. ‘Every Day For Future’ New-Topical, Cyberrock, Dance-Electronica, Orgastica-DJ & Cyberpoetry Concert by Michel Montecrossa and Mirakali in the Omnidiet Music-Hall in Mirapuri on 20th April 2019 starting 21:00 till 23:00 featuring Michel Montecrossa’s heartfelt New-Topical-Songs and Mirakali’s inspiring Orgastica-DJ Instrumentals that go along with the recitations of her expressive Zen-Style Cyberpoems. 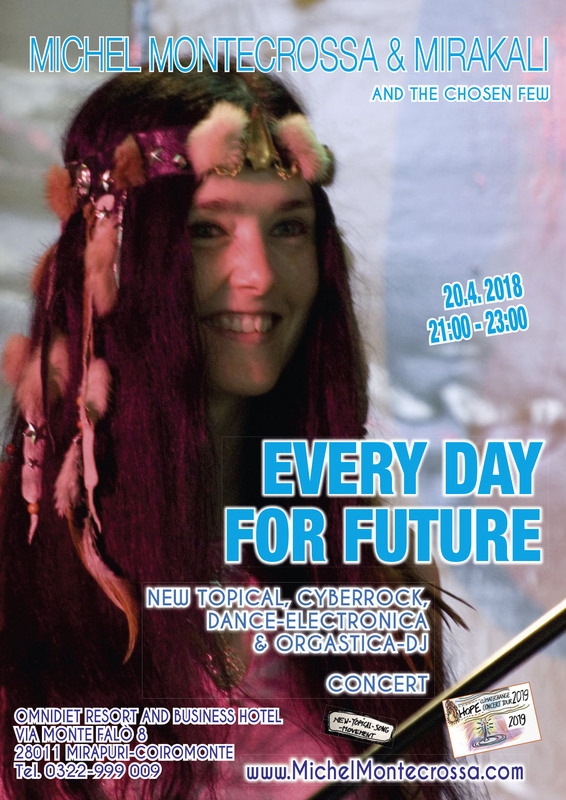 The setlist includes great songs like the title song ‘Every Day For Future’ by Michel Montecrossa as well as Mirakali’s futuristic dance Orgastica-DJ instrumentals like ‘Liberation Now’ together with her soulful Zen-Style Cyberpoetry like ‘True Heart’ and many more. Tonight live: ‘Man Of The Golden Star’ New-Topical, Cyberrock, Dance-Electronica, Orgastica-DJ & Cyberpoetry Concert by Michel Montecrossa and Mirakali in the Omnidiet Music-Hall in Mirapuri on 13th April 2019 starting 21:00 till 23:00 featuring Michel Montecrossa’s energy of Cyberrock Songs and Mirakali’s exciting Orgastica-DJ Instrumentals that go along with the recitations of her expressive Zen-Style Cyberpoems. 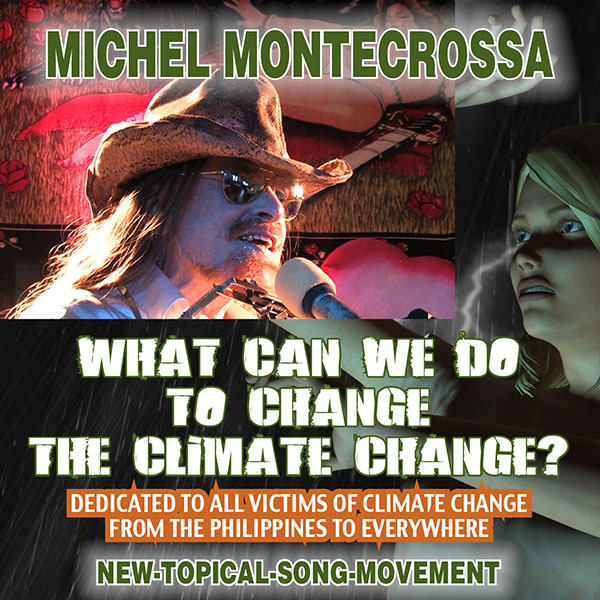 The setlist includes great songs like the title song ‘Man Of The Golden Star’ by Michel Montecrossa as well as Mirakali’s futuristic dance Orgastica-DJ instrumentals like ‘He – The Man’ together with her soulful Zen-Style Cyberpoetry like ‘A Lasting Moment’ and many more. ‘Man Of The Golden Star’ New-Topical, Cyberrock, Dance-Electronica, Orgastica-DJ & Cyberpoetry Concert by Michel Montecrossa and Mirakali in the Omnidiet Music-Hall in Mirapuri on 13th April 2019 starting 21:00 till 23:00 featuring Michel Montecrossa’s energy of Cyberrock Songs and Mirakali’s exciting Orgastica-DJ Instrumentals that go along with the recitations of her expressive Zen-Style Cyberpoems. The setlist includes great songs like the title song ‘Man Of The Golden Star’ by Michel Montecrossa as well as Mirakali’s futuristic dance Orgastica-DJ instrumentals like ‘He – The Man’ together with her soulful Zen-Style Cyberpoetry like ‘A Lasting Moment’ and many more.